Note : Your request will be directed to Diamond Microwave. 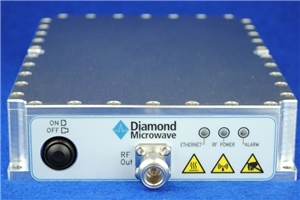 The DM-X200-02 from Diamond Microwave is a X-band GaN pulsed solid state power amplifier that operates from 8.2 to 9.5 GHz. It delivers an output power of 200 Watt. The PA has a pulse width up to 100 µs with duty cycles up to 15% . It is available in a module that measures 220 x 150 x 41 mm with SMA and N-type female connectors and is ideal for use in demanding defence, aerospace and communications applications.